Receiving a Tabby Award places the AccuWeather app among the "best of the best of best" in a massive market of more than 4.7 million apps. AccuWeather Global Weather Center - February 7, 2019 - AccuWeather, the world's largest and fastest-growing weather media company as well as the leader in weather-related data, business and predictive analytics, won the 2018 Tabby Award for Best Weather App for its popular iOS app. The Tabby Award is the most comprehensive awards program honoring the best apps for tablets and iPads. 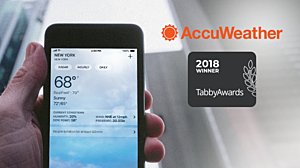 "All of us at AccuWeather are honored to receive the 2018 Tabby Award for our iPhone app," said Steven Smith, President of Digital Media for AccuWeather. "Our goal is to give users the features and utility they want, while delivering weather forecasts and warnings with the proven Superior Accuracy™ they trust. This recognition further demonstrates that AccuWeather is building on our foundation of creativity and innovation to offer the best weather app experience available, enabling our users to make the best decisions when weather is concerned." With all iOS and Android apps and games eligible and under consideration, winners were selected based on a combination of quantitative metrics and qualitative factors. The analytical evaluation component focused on app store user review scores submitted over the course of 2018 to measure user engagement. The qualitative component-benefiting from the Tabby Awards expertise in judging app and game awards since 2012-focused on user interface, design, and innovation. In addition to AccuWeather, winning apps included such recogzined brands as Spotify, TikTok, Headspace, Waze, Rosetta Stone, Eventbrite, Twitch, and Airbnb. "With nearly 4.7 million consumer (non-gaming) apps available today on Android and iOS combined, our mobile app award winners are positioned in the top 0.001% of a massive market - these are the best of the best of the best," commented Paola Schaw, Executive Producer of the Tabby Awards. AccuWeather apps for iOS and Android are available at no cost and provide the most accurate, actionable weather forecasts and warnings in an innovative, advanced mobile experience personalized to each user worldwide. Exclusive industry-leading features include the patented AccuWeather MinuteCast®, the leading minute-by-minute precipitation forecast for the next two hours hyper-localized to a user's exact street address or GPS location with precise start and stop times. The app also includes AccUcast™, the only crowdsourced weather feature that provides current weather conditions and hazards submitted by users in a real-time global animation map display, plus AccuWeather RealFeel®, Future Radar, and much more. In addition to world-class features, AccuWeather was reconfirmed as the most accurate source of forecasts and warnings over the next five favorite weather sources in the categories of windspeed, precipitation and high temperatures worldwide in the most comprehensive study of forecast accuracy ever undertaken. Independent industry tracker ForecastWatch gathered forecast data including 95 million forecasts from 1,140 locations over a three-year period, and AccuWeather demonstrated the consistency and reliability of its forecasts, proving its wind speed accuracy to be 33% more accurate, its precipitation forecasts to be 21% more accurate, and its high temperature forecasts to be 10% more than the next ranked provider's, respectively. The award-winning AccuWeather app is available free in the iOS App Store and the Google Play Store. AccuWeather, recognized and documented as the most accurate source of weather forecasts and warnings in the world, has saved tens of thousands of lives, prevented hundreds of thousands of injuries and tens of billions of dollars in property damage. With global headquarters in State College, PA and other offices around the world, AccuWeather serves more than 1.5 billion people daily to help them plan their lives and get more out of their day through radio, television, newspapers, smart phones, tablets, connected TVs, the AccuWeather Network and AccuWeather.com. Additionally, AccuWeather produces and distributes news, weather content, and video for more than 180,000 third-party websites. Among AccuWeather's many innovative and award-winning features available free to the public are MinuteCast® Minute by Minute™ forecasts with Superior Accuracy™. Furthermore, AccuWeather serves more than half of the Fortune 500 companies and thousands of businesses globally. Dr. Joel N. Myers, Founder and Chief Executive Officer, established AccuWeather in 1962 and is considered the "father of modern commercial meteorology." Dr. Myers, a leading creative thinker and visionary, has been named "the most accurate man in weather" by The New York Times and one of the top entrepreneurs in American history by Entrepreneur's Encyclopedia of Entrepreneurs. AccuWeather™, AccuWeather MinuteCast®, Minute by Minute™ RealFeel®, AccuCast™ and Superior Accuracy™ are all trademarks of AccuWeather, Inc.